What’s that old John Denver song? Look at that blue sky! And nary a black cloud in sight. Well, a few gray ones still hovering. We boondockers on Darby Well Road outside of Ajo, Arizona, have had three dark days, two of them almost constant drizzle. I’m happy as long as I’m warm, have food, and can read a book. Spike and Bridget are happy as long as they’re warm, have food, and can nap. Up to point. Then those canine muscles have to pump their legs somewhere! The sunshine has people and dogs emerging from their various boxes and eggs like bears in spring. 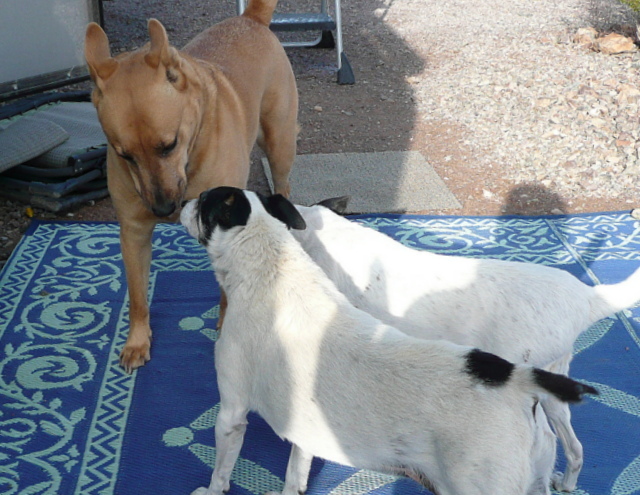 My neighbors, Rick to the east and Judy to the west, are outside playing with their canines. I hear an occasional vehicle on the road. Birds sing. Bridget and Spike happily trot down the lane on their first, full walk since the rains came. It’s good to be out and about again. Funny how the weather makes such a big difference in the daily life of boondockers. Bridget and Spike dash to the side door of the PTV. Soon we drive up to Bill and Ann’s campsite. Ann is busy outside at her work table. She shows me the progress she’s made on the stained glass window project. The hot air balloons are complete. Next she adds the sun and finishes the sky. “This is coming out very nice,” I remark as I examine her creative mix of shapes and colors. Bill steps out of their travel trailer holding Julie (the doxie) who’s barking like a maniac at surprise visitors. Sammy the beagle greets his pals and looks up for some attention from me. The crew and I don’t stay long. It’s late afternoon and turning chilly outside. Off we go to the grocery store! Bird feeder update . . .
Can you believe you’re reading a bird feeder update? Well, I can’t believe I’m writing one. Anyway . . . This morning I’m sitting at the big window at the back of the BLT, having recently returned with the crew from our walk. The usual suspects are outside at the feeders — doves, woodpeckers, hummers, finches, a few black-throated sparrows. Some newcomers make the scene. A covey of Gambel’s quail arrives to check what all the commotion is about. They discover the seed scattered on the winding path, around the post feeder, and under the hummers’ feeder. This makes them run like schoolchildren on a playground. A few run this way, a few run that way. A group huddles for a moment, then scatter, darting hither and yon. Cute top knots. I count ten as they scurry away into the creosote and brittle-bushes across the lane by our campsite. I pause writing this entry to run outside and catch the sunset. How can anyone say the desert is boring! I can almost hear a symphony . . .
Well, rain again last night. Blue skies this morning, partly cloudy, and warmer. Over the months in which the crew and I wandered around the West, I accumulated a long to-do list. I saved those items for when boondocked on the Darby Well Road in southern Arizona. Now we’re here and the weather isn’t cooperating. The list? Order bank checks, order an Anderson connector for the damaged power cord, order a replacement Rhino-flex sewer hose for the one I damaged, paint the chipped hitch crank, paint the PTV’s gutter where the old paint has peeled off, put another coat of polish on the BLT, wrap up the financial reports for 2012, beef up the “Shopping List and Links” pages, email America’s Mailbox and have them forward my mail, . . . and for heaven’s sake, woman, get a haircut! The easy part of the list is checked off. I’ve ordered stuff, emailed, and purchased the paint I need. Now I wait for a warm, dry day. Time for me to walk the crew. Their Canine Corner will reappear soon! This entry was posted in Simple living and tagged Ajo, birds, boondocking, desert, dogs, rat terriers, solar, Sonoran, stained glass, sunset. Bookmark the permalink. Isn’t the desert great after a rain storm? I sure enjoyed your sunset pic! Hello, Jim! Yes, the desert rain cleans things, but I’m done with rain. Bring on the sunshine! Hi Sue, I always looked forward to seeing the desert flowers come alive after the rains.. I don’t think this is the right time of year for the rain to bring out the flowers. I’ll look for them though, as I always do when the crew and I walk the desert. Loved the bird pictures you added today! Your pictures are always a great addition to your blog but it was especially interesting to see pictures of birds that we don’t normally see in Conroe,Tx. I put the bird pics in so people in other parts of the country would know what I’m writing about. I can’t take credit for the photos though. They’re royalty-free images I took off the web. That was an incredible sunset. Thank you for sharing it. You’re welcome, Betty. Imagine the colors of that sunset extended around you to the left and the right. I think tonight’s sunset will be another showstopper. Plenty of interestingly shaped clouds to the west. When you order stuff, how do you get it? General Delivery at the nearest Post Office? Friends are sure nice to have close by. 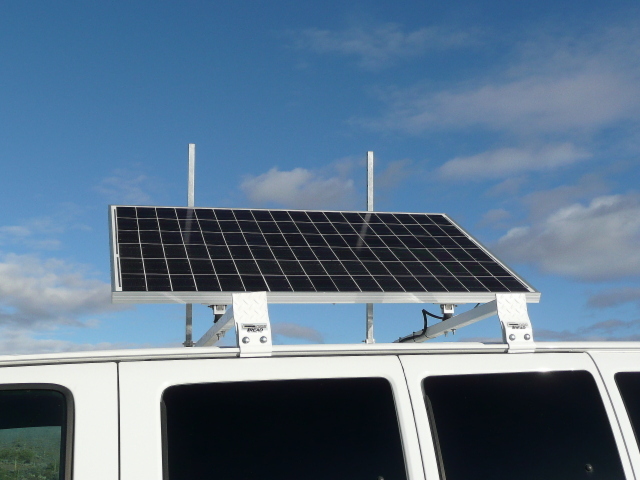 How is cell phone reception where you are now? For emergancy use you could buy a set of Motorola type walkie talkies for $70 at Walmart. Give one to Rick for reasurence. Then when you leave take his with you and do the same thing with other friends you run into. It is better than firing 3 shots in the air because now days people are so civilized they have forgotten the International Distress Signal. But you know you are in Apache territory so I would save the ammo for ‘you know who’…and don’t shoot your last bullet, save that for yourself. That’s the real Motto of the old west tee hee hee. Keep a sharp eye out for those Saguaros that move around in the dark and sleep tight. I have stuff shipped to the Ajo post office by General Delivery. Walkie-talkies, eh? I’ll save the last bullet for the walkie-talkie when I tire of carrying the thing around. I don’t think John Denver would have minded your new creative lyrics to his tune! Those sunsets are unbelievable. Maybe we have some pretty ones here in Dallas but I’m always “too busy” to notice. Think I will start going outdoors and take a look. Getting ready to go on Amazon and order my son’s birthday and Christmas presents – through your link of course! I got a little behind to say the least. I know what you mean about being too busy to notice the sunsets. I’ve been there. I’m so happy you got behind on your shopping and that you’ll catch up through my links. Thanks. The desert is so clean, fresh and just plain pretty after a few days of rain. The pics are great and glad you are enjoying the sunshine. I hope you are enjoying the sun, too, Pat. The wind is cold though. The crew and I run back inside after a few minutes. Hi, Rusty! I hope you got your truck fixed and running. I know you had some major work to do on it. Hello to Timber! BTW, love your desert photos. You’re absolutely right .. the desert has it’s own beauty. Not everyone appreciates it, but everyone loves a beautiful sunset. Glad you enjoy my desert photos. I took about seven spectacular sunset photos and managed to pick one to post. Don’t let her put a guilt trip on you. Real flowers don’t provide a perch and the hummers do just fine without. So many different birds…………..are you a birder or do you have a book? Wow your list of things to do makes me tired. Beautiful picture of the sunset. PS John Denver is one of my favorites…after Anne Murray. I wouldn’t call myself a birder. I have a couple of field guides to birds. The one I’m using these days I picked up at the thrift store in Borrego Springs for a dollar — The Audubon Society Field Guide to North American Birds, Western Region. It has color photos and a vinyl (simulated leather) cover. Retails at around $20, unless you’re lucky and find it at a thrift store. Aha! Another item for our shopping page! Thanks for the idea. Yeah, $20 was the price in a store. Hi Carla . . .If you clink on any of the links to Amazon on my blog, I get credit. For instance, if you click on the outdoor rug link, then look at blenders, and end up buying shoes and a socket wrench, I get credit for the shoes and the socket wrench. I like that phrase “tons of shopping to do!” Shop on, Carla! Congratulations! 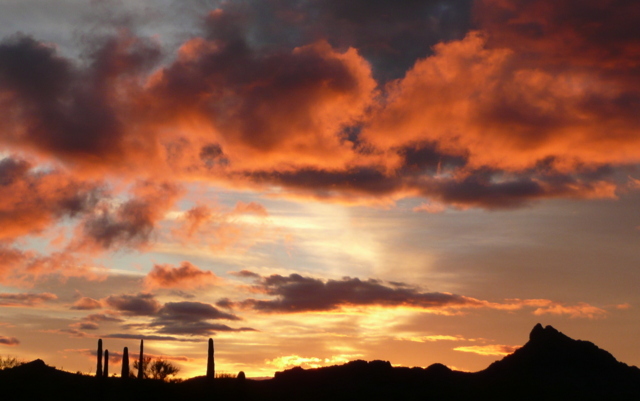 Your desert sky pic just made it to my desktop! This is the second time a “Sue Original” has accomplished this feat. We’ve been through 4 gloomy days but it’s over for awhile. As far as us here in Surprise the forecast is mid 70’s for about 2 weeks….We’ll see but enjoy the Vit D in the meantime. Two weeks of mid-seventies… nice. Ha! My photo on your desktop again. It is a great sunset which I can’t take credit for. I almost missed it, sitting inside typing up my blog entry. I peeked through the blinds, grabbed the camera, and ran outside. exquisite sunset, quail look like what my uncle used to call bob-white, sure miss hearing them here in OR.we Don’t hear meadowlarks anymore either, to much line to line farming! !When I get well, I’m gonna plant lots of cover for the birds.we have A family of quail in our yard, but no calls, so guess they’re not bob-whites.We came home one day to find one quail in our driveway, next day there were two, then eight or ten babies, then they went across the stree, two many dogs here, hop they’ll be back! !i need to spread some seed around. The quail do look somewhat like bob-whites. The bob-whites are mostly east of the Mississippi with some introduced to the Pacific Northwest. I remember their unique call. The quail go yip-yip-yip, which can be considered cute or annoying, depending on one’s mood or how long they’ve been yipping. Hope your quail come back. They are fun to watch. Texas have Bob-White Quail as well. Yours are Gambel’s Quail which look much like California Quail. 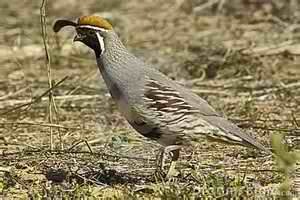 In New Mexico, we have Scaled Quail as well as Gambel’s. Where Bob-Whites will fly up in a rush when one walks upon them, Gambel’s will more likely run along the ground, not as likely to fly right away. But they will & do. So glad the deserts are getting rain. Pretty much the time of the year for the rains; and, the more there is the more beautiful and abundant the desert flowers will be. Hi Emily . . . I need to figure out a way to see the desert flowers without seeing the desert snakes. Thank you for posting photos of the birds even if they aren’t Sue originals. Those quail are so adorable they look almost cartoon-ish. By the way, hummingbirds rarely sit while feeding. They have to hover over a flower so that’s why there are no perches for them on the man-made feeders. Aha! I learned somethiing new about hummers. Very interesting. Thanks, Donna. About the weather… You’re right. I’m spoiled. After many years in Florida, then Georgia, and now the desert Southwest, the memories of freezing rain and snow are dim. I don’t know how people put up with it. It’s true that they can use the perch. I just meant that many times when they feed from flowers they have to hover. I would guess they would be happy either way. Actually, the issue is energy. Hummers use much energy to remain in a hover whereas with the perch, they get needed rest. It is obviously possible for them to feed either way. I have a feeder with perches but wildlife photographers prefer to shoot their pics with the bird in a hover so they don’t use perches. I guess it depends on motive. Sue your sunset photograph is world class……………..in fact I have saved it and it is now my screen saver. Loved hearing about the birds too……………….no your desert life is not boring!! Who was it who said there are no bad photos of babies or sunsets? I think I may have that wrong. It’s pretty difficult to take a bad pic of these Arizona sunsets. That is a good site, Mick. I like that “mouse-over” feature — an easy way to learn birds. It even has a bird game. We are in Tucson now. Been having some of the rain, now & then. Been here about two weeks visiting our daughter & grandson. Had some sunny, warm days & some not. Have enjoyed them both (sunny time, rainy time). A little harder to do the rainy in a TT. Change is good. I’m not enjoying the rain as much as I used to as I’m needing to be online a lot lately and you know I rely on solar power. I do fine “cooped up” in the BLT. Spike is the one who has trouble with it after a couple of days. I love the quail. They are like little fat Victorian ladies… running about wearing their Sunday hats with the feather. I always laugh as they run rather than fly until you get really close. I long to see the finches and hummers after reading your post. South of Chicago what I see mostly is geese, geese and more geese. Goose poop everywhere. Yuck. I do enjoy seeing our sharp-shinned hawks. They are so fat this year I don’t know how they manage to fly. It must be the overabundant supply of rabbits and voles from our long spring and summer seasons this past year. Tomorrow our high should be in the low 60’s with 100% chance of rain. By Thursday we won’t make it out of the teens. I’d rather be where you are than going through this roller-coaster ride of weather! Your sunset photo is gorgeous. To be able to watch that kind of beauty while listening to the sweet sounds of the birds seems like a little slice of heaven. Sometimes I wonder why people read my blog when enduring cold, rain, sleet, snow, and ice. The contrast would drive me nuts! I put out a feeder out for migrating birds and hummers but attracted a bunch of pigeons..yuck! So I got rid of the seed feeder and left the hummer feeder out….the pigeons went away but hummers stayed. A hummer once landed on my sister’s palm. The hummer sat there and sister slowly closed her hand around the hummer….we talked to hummer and it craned it’s neck this way and that way looking at us. Sister said Navajos believe that is a good omen. After a few seconds, sister opened her fist and hummer sat a bit then flew off. If the feeder is empty, the hummers hover at the window looking in….very strange. Talk about a sacred moment . . .Wow! That hummer must have felt very fragile in her hand, yet we all know they’re tough. I do get the feeling the hummers realize who provides the sugar water and they are curious. Yesterday a finch perched on the outside window sill. Aw, one remote place we lived, we had so many quail to watch…cute little birds!! Tis lovely to have so many visitors to your feeder!! Our time here is almost half over…and all those projects I brought with me…oh so much I will not be able to finish…and so much yet we want to do in this area too….whoever knew that retirement would bring so much busyness!! Hi Elizabeth… I know what you mean about retirement. If I allowed it, I’d be busy, busy, busy all the time. . . . and so much of it is fun stuff I want to do! Yes, I absolutely do believe I’m reading a ‘bird feeder update’- and hanging on every word! RVSue, I believe you’ve got it nailed and this post reflects it perfectl. The most important things in life: walking the dogs, watching the birds, stopping everything to watch the sunset. This is the real ‘to do list’, the things that truly matter- spending time with family and friends and enjoying nature in all her glory. Yep, I think you’ve found the perfect path! Thanks for sharing.